No matter the purpose of your visit, feeling comfortable during your stay in Studio or bigger apartment, having the right surroundings to relax and reload is the most important. Here is an overview of our apartment types. 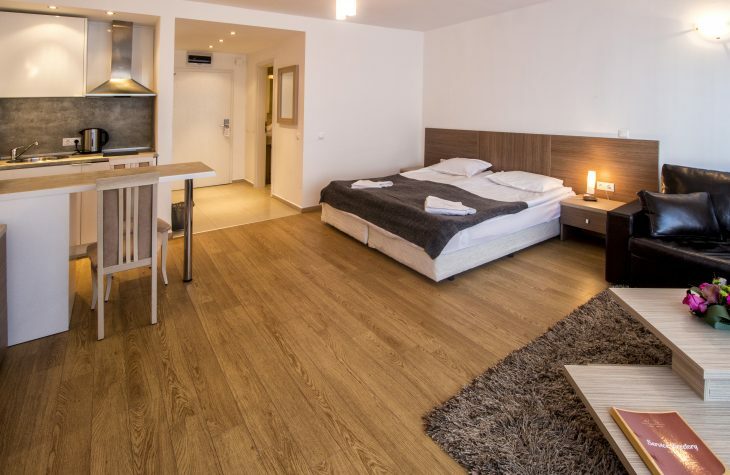 The Studios at Saint George Palace are spacious and comfortable. 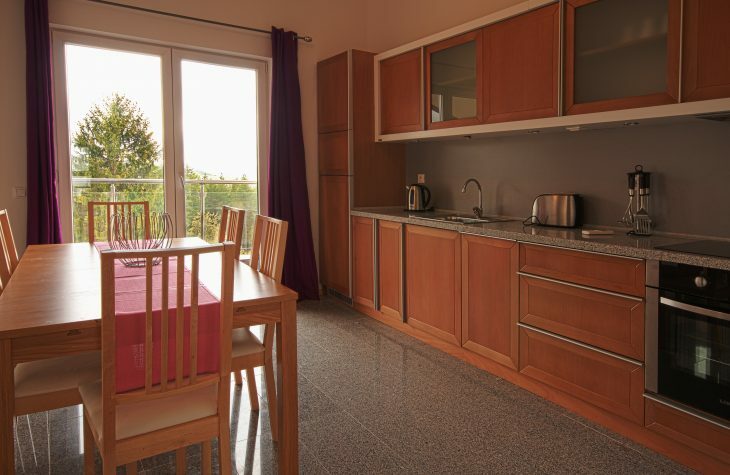 Well-equipped and furnished to a high standard, these units are perfect for couples and small families. Some of the Studios have sofa bed and balcony. Studios are with mountain, garden or city view. The 1 bedroom apartments at Saint George Palace boast stunning views over the ancient town of Bansko or the mountains beyond. They offer two separate rooms - living and kitchen area and a bedroom. They can accommodate up to 4 people – 2 in twin beds, 2 children up to 12 years old or 1 adult on a sofa bed. These apartments are ideal for families on a budget, but would also suit couples looking for space and luxury. Most of the apartments have balconies. The 2 bedroom and the 2 bedroom penthouse apartments at Saint George Palace have superb views and give a wonderful sense of space. They have large double bedrooms and most of them have 2 bathrooms (1 en-suite). These units would suit a family, or couples travelling together looking for extra space and luxury. 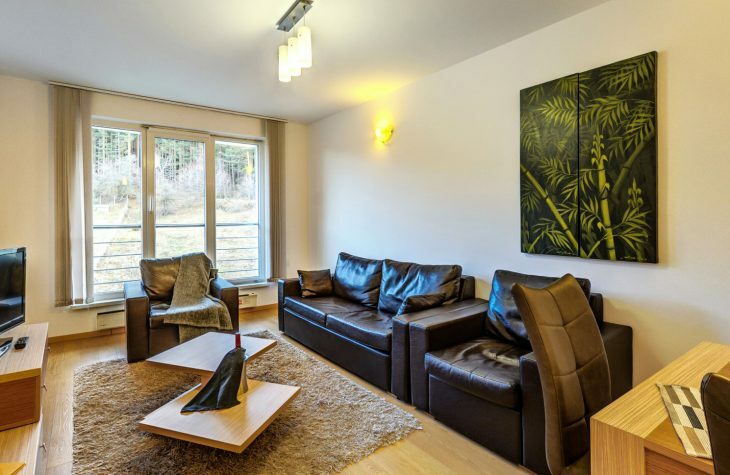 If you're looking for something extra special for your stay in Bansko, the 3 bedroom apartments at Saint George Palace should be top of your list. 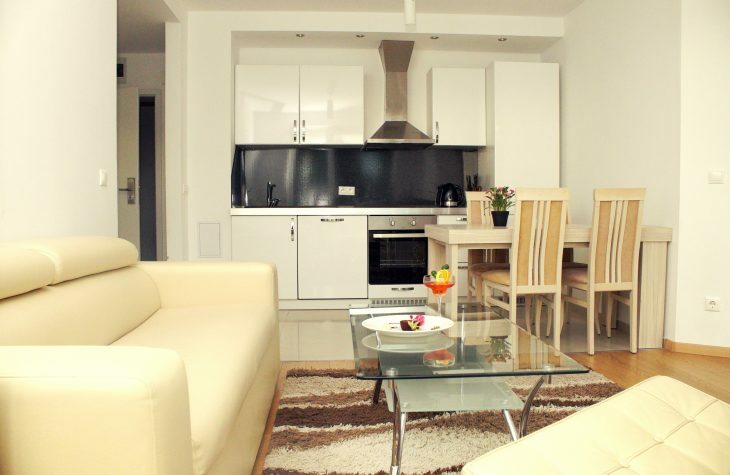 They offer unrivalled views of Bansko and the mountains and a truly luxurious sense of space. These premier units have 3 spacious double bedrooms, 2 en-suite bathrooms and a further restroom facility. They come finished to the highest standard. 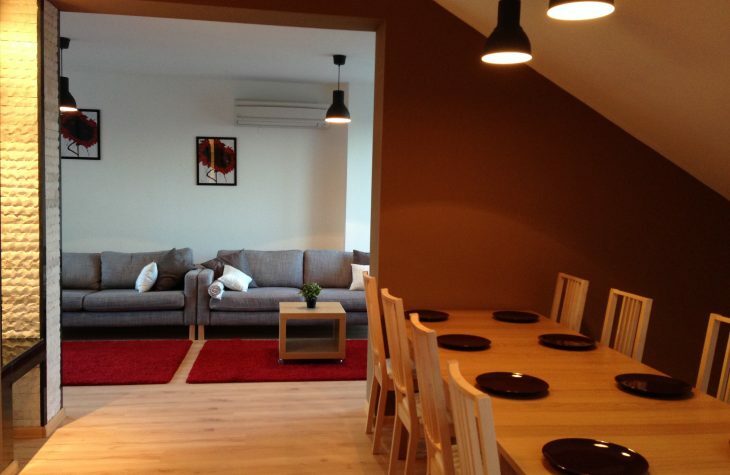 Our Four bedroom apartment is a wonderful choice of serviced accommodation if you are looking to stay in Bansko. In a wonderful location and decorated in a stylish and unique design, this apartment is a fantastic home away from home option for your stay. It offers more space than an average hotel room and includes a TV, fireplace, private Jacuzzi, WiFi, and so much more. If you are looking for a comfortable relaxing holiday - this is a great choice. The top of the range! 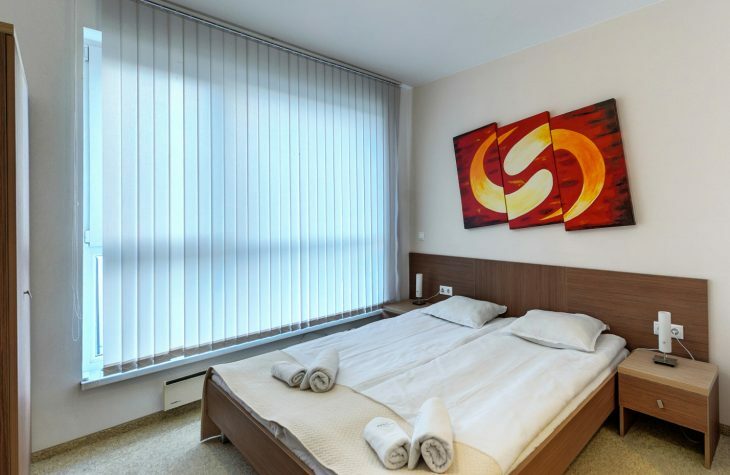 Our Five Bedroom apartment provides you with a host of additional benefits like fireplace in the living room and your private Jacuzzi with great view to Pirin mountain. You also get the extra luxury of early check-in just to make your stay more comfortable and convenient. This apartment offers a variation of bedrooms and their bed layout options, and has the facilities for self catering holidays. Please note that rooms slightly vary by view and set-up. The assigned room might not always correspond to a particular photo you have seen. 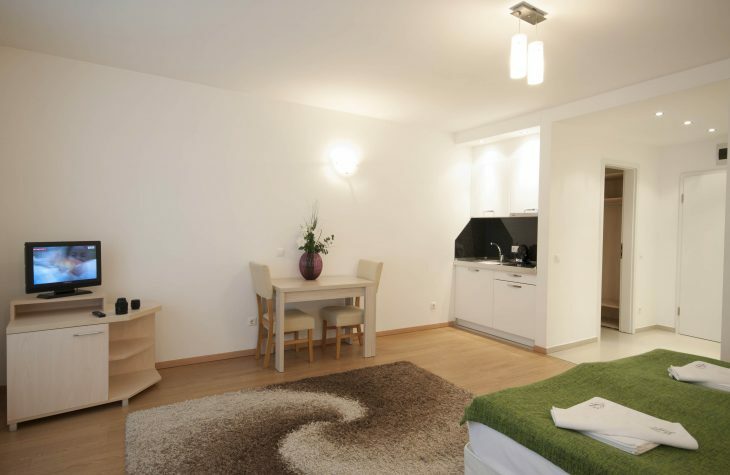 * Please note, our Studios and Apartments are prepared for you with fridge, kettle, cutlery and crockery. In order to maintain and meet all the hygiene requirements with our apartments, cooking equipment is not provided as standard. If guests would like to cook in their apartments there is a one off fee which covers the increased costs in servicing and cleaning these apartments. This service comes with a complimentary full cooking set. You can request Kitchen set on our Reception.